Thomas Keller is an American chef, restaurateur, and cookbook writer. I do believe this. The soul I bring to the food I make is love for my family. I try to do this every time but we definitely know when I have had an off day!! What is your soul you bring to your meals or maybe just your favorite meal? One of the guys who comes to pizza Friday suggested a Chicken Alfredo Pizza. It was a great idea! I made 2 of these pizzas in one night!! 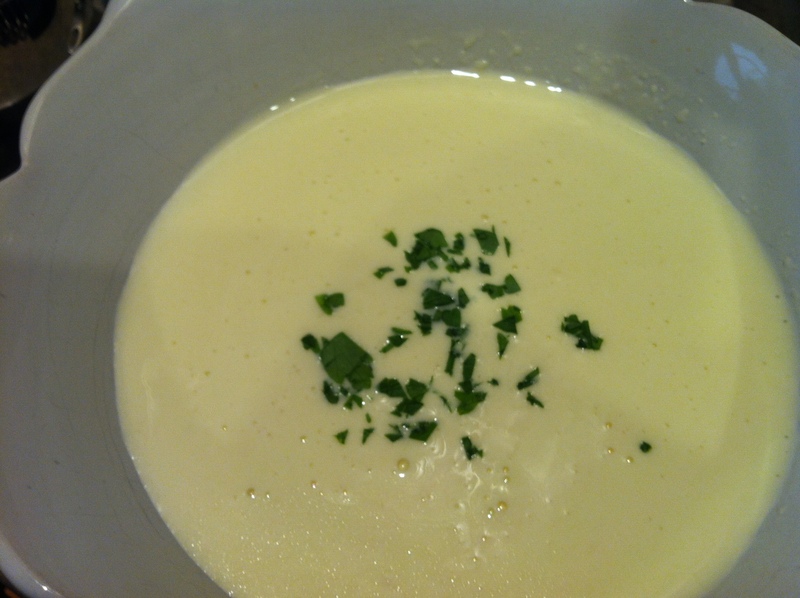 I have been making the Alfredo Sauce recipe for a few years. 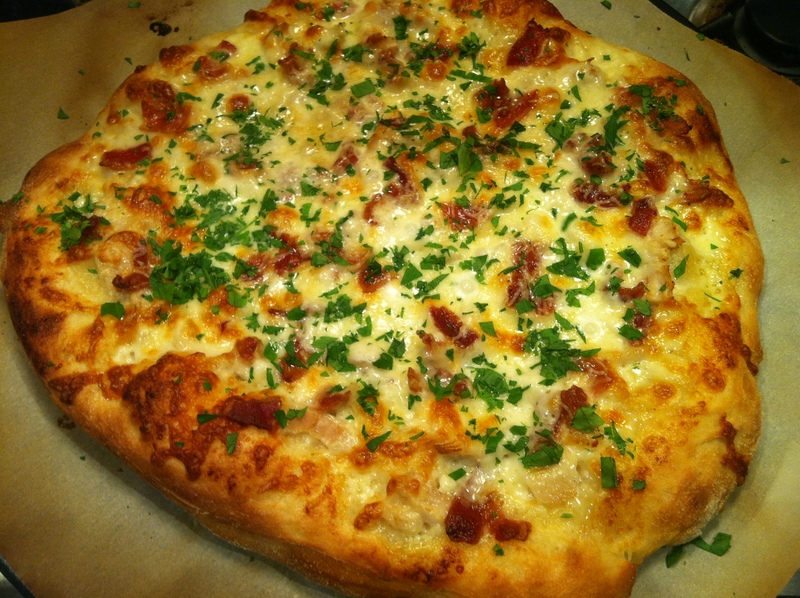 You could cut this recipe in half for just the pizza. I like leftovers for the next day for lunch using the sauce over pasta. This seems like it would take a long time but it doesn’t, I promise. 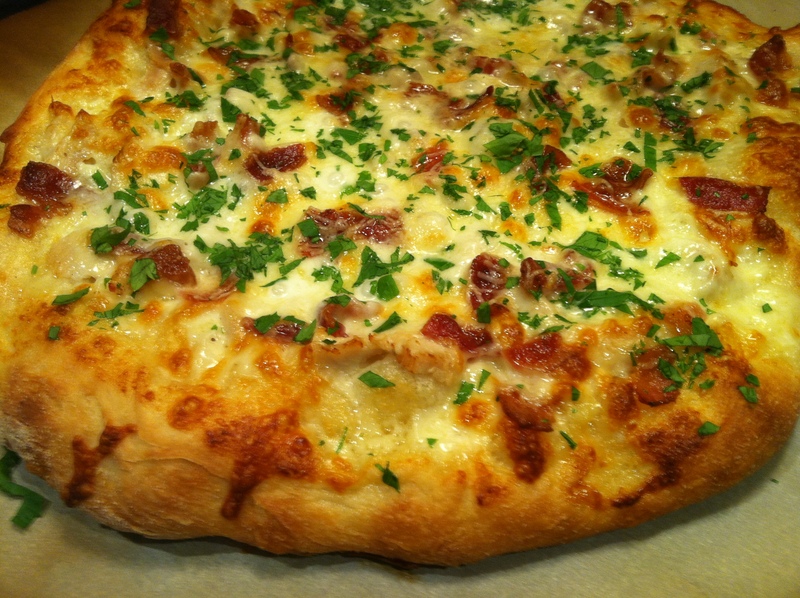 You must try this Simple and Delicious pizza!! The fact I made 2 in one night proves that, right?! 2. Add the garlic, cream, pepper and bring mixture to a simmer. 5. When the sauce has thickened, add Mozzarella cheese and stir until smooth. Stir often! 6. You are going to have leftover sauce. Why not make some pasta for those who may not want pizza! Now you can prepare the pizza. 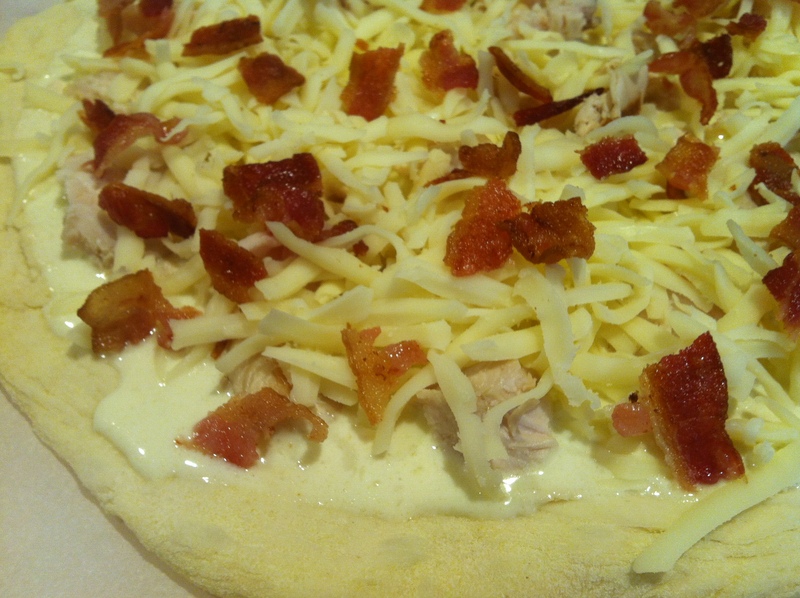 Spread Alfredo sauce over dough, add chicken, mozzarella, Parmesan cheese, and bacon. Bake at 475 for 15 minutes. When you take the pizza out of the oven garnish parsley over pizza. Chow down! This is a winner!! I had Martin and Martin pick up some beautiful fresh tomatoes and garlic at the Appleton Farmer’s Market last weekend. I had the best intentions of using them that weekend. A week later they were still on my counter!! I had to use them up or they would be wasted. Not my plan for these gorgeous tomatoes. I could make a tomato salad, salsa, pizza or a pizza sauce. Of course, why not a tomato sauce? Anyone who knows me knows I LOVE sauce. I whipped this up in no time. 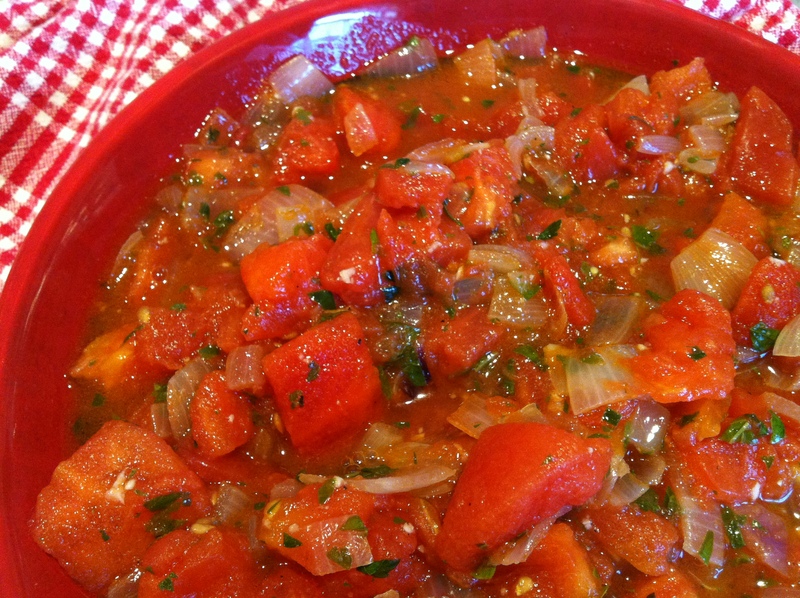 Here is my Simple and Delicious Farmer’s Market Fresh Tomato Sauce. 1. I take the skin off of the tomatoes. (You don’t have to do this.) The easy way to take the skin off the tomatoes is to boil water, drop tomatoes in the boiling water for 30-60 seconds and take out. Place in ice cold water and skins will peel right off. Easy! 3. Using a dutch oven or large saute/frying pan. Add 2 Tablespoons of olive oil over medium heat. Add red onion and saute about 5 minutes, Add minced garlic and stir together for about 30 seconds. 5. 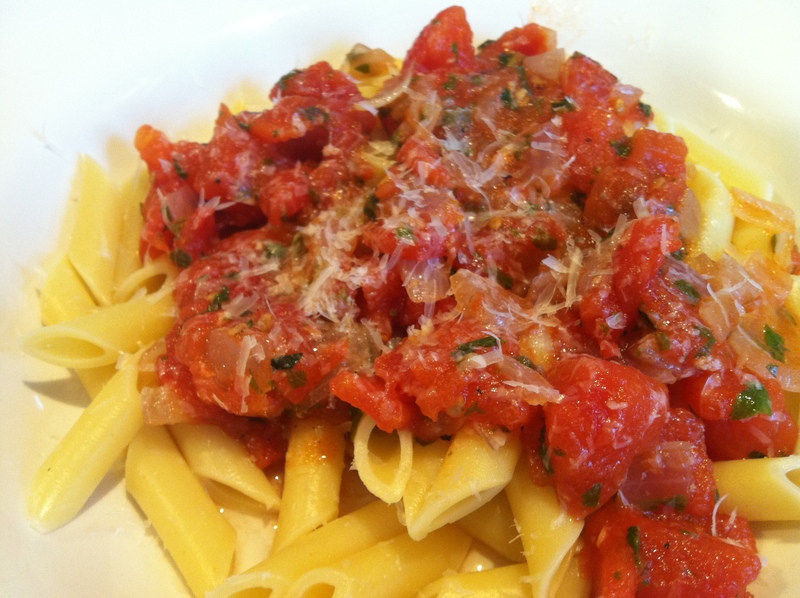 Serve over pasta with some fresh Parmesan cheese. ENJOY!